One thing about living alone, when something breaks, you can either fix it yourself or hire someone to fix it. I lack handy man skills, unlike my sister who can size up a repair, determine what's necessary and make that repair on her own. I think I have a fear of screwing up the repair worse than it is already so I don't bother. But there are times when the cost of having someone do the repair versus what it would cost you to do it, once you got over your fear, makes at least attempting it plausible. Years ago, Carole gave me a new shower head. I don't even know how long ago it was, that's how long ago it was. I bought a very interesting over the shower caddy that was metal painted with an aqua color that matched the tiles of the shower. Over the years, the paint has cracked and flaked so the underlying metal had started to rust. In the past year, it also wouldn't stay on top of the shower head, sliding down at the most inopportune times. In the past 6 months, in fact, it was so wobbly, the only thing I kept on it was a wash cloth, the toilet brush and a bar of soap. Putting even a mostly consumed container of shampoo would cause the thing to slide forward. Off to Bed, Bath and Beyond to find a shower head and a new over the shower caddy. The choices were nearly endless. The shower head was the easiest to select. I chose the shower caddy because it has a rubber piece, not visible, that goes over the shower pipe and provides more stability to keep the caddy in place. It also comes with two suction cups to adhere the caddy to the wall. I've never, ever found those useful. They went in the drawer of "maybe useful later" items. The thing that strikes me most about this is the amount of packaging I have. 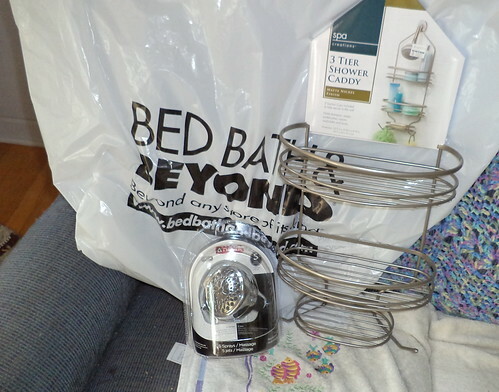 There were two, TWO, bags from BB&B; one for the shower head and one for the caddy. Why do I need two? I didn't see the gal bag the shower head in one bag and then put it in the bag with the caddy or I'd have said there was no need for two bags. 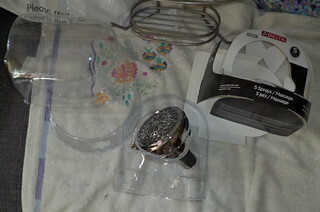 The shower head was packaged in double plastic. Once I cut the main package, the head was nestled inside another plastic sandwich. I can recycle the whole thing but why? American packaging choices make no sense from an environmental point of view. I don't need all this for a shower head. But, once liberated and with pipe wrench in hand, I attempted to remove what was left of the old shower head. It would not turn. Try as I might, I could not get the piece to budge. Then I thought of something that a former co-worker, Wendy, told me. "Lefty loosy. Righty tighty." I was turning the wrench the wrong way. Off came the piece and the new shower head screwed on easily. It's supposed to concentrate flow so you use 10% less water in the shower. It has 5 settings, which I probably won't ever use. It was inexpensive and easy to install. Success! The shower caddy fits nicely over the shower and my shampoo, conditioner, shower gel, wash cloth and toilet brush fit nicely on it. The soap will too except what I'm using right now is a sliver and it keeps falling through the openings. I'm proud of myself for fixing this on my own. It might seem obvious that this is an easy repair, but when you doubt yourself, even easy repairs can seem like climbing Mt. Rainer. Once I completed this, I had to take a shower. Ahhhhh.